The months that passed since the previous issue (11.4) came out have been exciting. In this issue, we originally intended to focus more on Klang Valley, hence its theme, ‘Playing Tourist in Klang Valley’. Readers will be able to obtain ideas on where to go in Klang Valley in pages 48 (Paya Indah Wetlands and Sepang International Circuit), 52 (Shah Alam and Klang), 58 (Putrajaya/Cyberjaya), 68 (Eat.Travel.Write 4.0 Selangor programme) and 80 (Kembara Kraf Selangor 2016), including 126 (a new smart accommodation in Kuala Lumpur concentrating on wellness called Oasia Suites Kuala Lumpur). 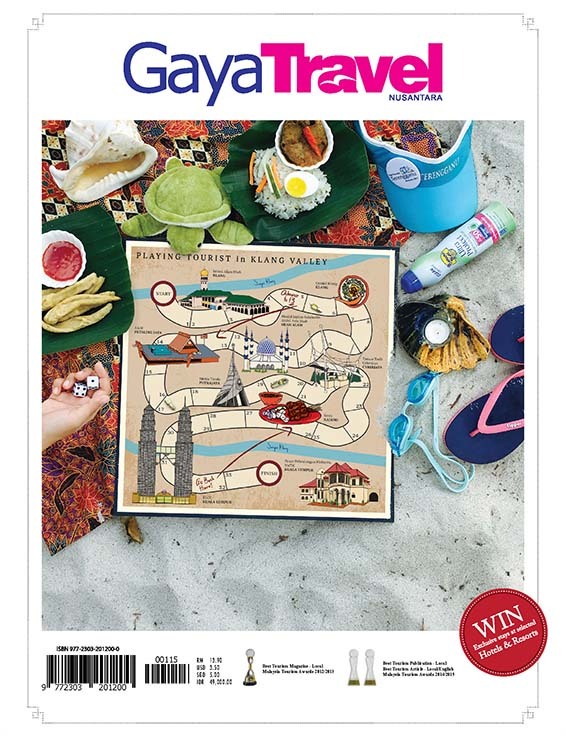 Gaya Traveller also features places that residents of Kuala Lumpur can experience like tourists in the city (page 23). Once readers have enough of Klang Valley, then why not experience something totally different like heading to Kelantan’s eco-tourism hot spot (page 64) to commune with pristine nature? Till then, safe travels and see you in the next issue! Cover Photoshoot by Furqaan Hod. Page 48. #TSDAYOUT: Race Your Heart Out! Page 100. Discovering Central Japan by Bus!